Faced with a perpetually evolving legislation leading to overlapping tax implications, Corporates are constantly challenged with Tax and Regulatory complexities. The Story is further complicated by a plethora of Compliance obligations under various Tax and Corporate Regulations. We offer robust retainership service which provides comprehensive Tax and Regulatory support, combined with advisory and compliance support on an ongoing basis. Indian Tax Regulations are perceived as being one of the most complex set of legislation in the world, generating in its way, considerable tax litigation. The job requires being updated at all times, with latest judicial developments, duly complemented by interpretive skills and experience to produce and effective defense against litigation. We have an experienced team, with a proven track record to offer comprehensive Tax and Regulatory support, combined with Advisory and Compliance support on an ongoing basis. The firm specializes in International Taxation with capability to deal with country specific Tax treaties. Our services represent clear insight in to Tax issues that Corporates face regularly. The firm renders services in the area of providing opinions on complex cross border tax issues, Structuring tax efficient structure, certification of tax withholding under Section 195 of the Income Tax Act, 1961, compensation issues with regard to the Expatriate employees, etc. The team has considerable experience in handling Transfer Pricing issues and guiding Corporates in selecting the appropriate method to develop an effective Transfer pricing strategy. We also offer compliance services such as Transfer Pricing Study, representation before Tax authorities etc. Advising clients on and ensuring compliance with the provisions of the Foreign Exchange Management Act, 1999 (FEMA). Counsel on the policies of the Government of India on Foreign Direct Investment (FDI). Preparation of documentation and obtaining approvals from the Reserve Bank of India for the allotment/ transfer of shares to foreign citizens and foreign companies, establishment/ winding-up /extension of and various other matters pertaining to the operation of Liaison/ Branch/ Project Offices of foreign companies operating in India. Drafting of applications for and obtaining approvals of foreign investment proposals in various sectors of economy from the Foreign Investment Promotion Board (FIPB), amendment and extension of FIPB approvals, application for compounding of offenses, etc. Obtaining required clearances for outbound investments from the RBI, etc. 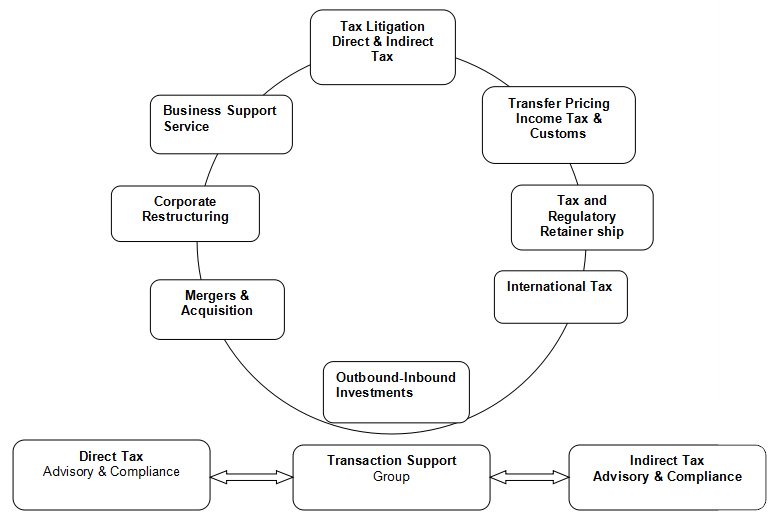 and advising on appropriate structuring of outbound investments, so as to make them most tax effective. The Firm specializes in providing specialized consultancy services to foreign companies including the appropriate structuring of the Indian entity, advice in the area of Income Tax, Corporate Laws and Foreign Exchange Laws. For newly established entities, various handholding services are provided in the initial set up period, till they gear up their operations fully. Such services include accounting, payroll, secretarial and other administrative services. Nominee directors and shareholders are arranged for corporates wishing to set up operations in India, to speed up the set up process. Obtaining required clearances for Inbound investments, from the FIPB, RBI, etc. and structuring transactions to meet specific objectives, assisting in obtaining statutory clearances for Technical and Financial collaborations, Joint Ventures/ Wholly Owned Subsidiaries, etc. Counsel on and ensuring compliance with the provisions of the Companies Act, 1956. Incorporation of companies, Registration of Liaison, Branch and Project Offices of foreign companies with the Registrar of Companies. Maintenance of minutes of Board Meetings, Extraordinary General Meetings and Annual General Meetings. Preparation and filing of Annual Returns and other statutory documents as required under the provisions of the Companies Act, 1956, and assisting clients in handling their secretarial function. The firm provides a comprehensive range of Audit & Assurance Services that include Statutory Audit, Internal Audit, Management and Systems Audit, Advisory and Implementation services for US GAAP / IFRS / foreign reporting. The team has valuable experience and specialization in audits of e-Commerce Companies, IT sector, Infrastructure, Aviation Services, along with Trading and Manufacturing sector. The Firm also advises on various accounting issues and its compliance with the relevant Accounting Standard / pronouncement by the Regulatory bodies like ICAI / SEBI etc. and deals with compliances under Company Law. The firm also undertakes Bank Branch Audits, Concurrent audits, Stock and Revenue Audits etc. in respect of various Bank branches. Corporate Governance is the norm of the day and the firm provides advisory and assurance services in this regard to help Corporates to maintain the effective and efficient Corporate Governance Structure. The firm is also authorized by Financial Reporting Council of Mauritius for doing audits of Companies incorporated there. Due Diligence, Valuations, Project Appraisal etc. Agreements, Asset Purchase Agreements IPR protection and Transfer of Technology Agreements etc. Singapore, Dubai, Jersey, Cyprus, B.V.I., etc. Taking charge of the entire payroll, accounting and other back office functions of clients, including accounting services. Preparing Financial Projections for availing bank / institutional finance. Assisting in buying & selling securities listed in stock exchanges. The firm provides quality support services with a complete suit in the areas of TDS, Services tax, payroll processing etc. The range of services include verification of transactions involving TDS and Service Tax implications, computation of liability there under, payment support and filing requisite periodical returns. The firm helps the clients in payroll functions by providing them end to end solutions right from maintaining employee records, payroll processing, computation of employee deductions including tax liabilities and advising individual employees on personal income tax aspects. Entities needing Accounting support find the quality and timely accounting services from the firm as we have the dedicated and specialized team to cater to Accounting function. The team has the experience of working on various accounting platforms and its diverse applications. The firm also helps Corporates in converting their financials into XBRL format for regulatory filings.